The latest feature additions to Adobe's film, broadcast and video content platforms focus on artificial intelligence-powered post-production editing tools driven by Adobe Sensei, workflow improvements, new text and graphics enhancements and performance buffs. "Video is experiencing a golden age as video professionals across broadcast, film, streaming services and digital marketing are facing higher consumer demand for content creation. Meanwhile production timelines are shorter and the list of deliverables are longer," said Steven Warner, Adobe's vice resident of digital video and audio. "Through optimized performance and intelligent new features powered by Adobe Sensei, video professionals can cut out more tedious production tasks to focus on their creative vision." Starting with Premiere Pro, Adobe is introducing a new Freeform view that expands project timelines into a large open canvas for better visualization and content manipulation. The Freeform Project panel allows users to arrange clips, sequences, bins and other assets into custom layouts, while clips can be color coded, stacked, grouped and resized for easy organization. Various layouts can also be saved and applied to different tasks within a single bin. To help arrange graphics and other media assets, Adobe is introducing new Rulers and Guides with improved snapping functionality. A dedicated View menu consolidates Program Monitor commands and assets for Guides and Guide Templates, while the Essential Graphics panel now includes options for styling text. On the audio end of Premiere Pro, Adobe incorporates Adobe Sensei-powered Auto Ducking to detect speech and automatically adjust ambient sound levels during scenes with dialog, music or sound effects. The automated adjustments can be fine tuned in the app's user interface. Other additions include audio workflow improvements, faster Mask Tracking and various performance improvements including hardware encoding enhancements for H.264 and HEVC, Metal acceleration for improved playback of RED camera footage, better GPU balancing and a System Compatibility Report utility. 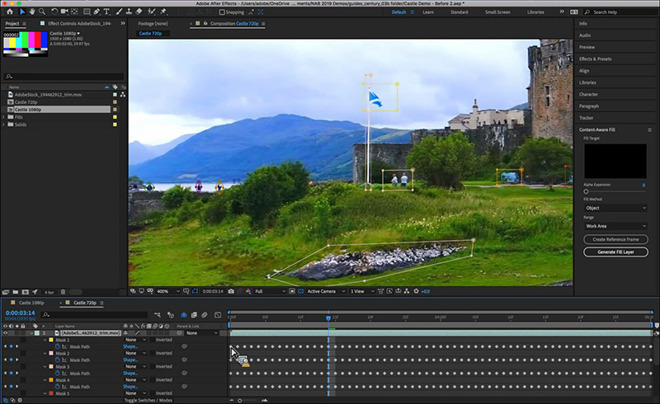 After Effects also benefits from Adobe Sensei technology, which powers a new Content-Aware Fill tool for video. The feature is useful for easily replacing unwanted objects or image imperfections with a background generated with data borrowed from nearby pixels and other frames in a given clip. Adobe says Content-Aware Fill estimates motion and depth of a masked object to "intelligently assemble a replacement background." Editors can now save Guide Templates and share them to colleagues using Premiere Pro. After Effects also benefits from a range of performance improvements including accelerated rendering when applying GPU effects, automated syncing with Adobe Fonts, faster load times for complex projects, deBayering support for Metal on macOS and improved hardware decoding for H.264 and HEVC. The audio app also garners manual keyframe value editing, new keyboard shortcuts and a Zoom to Selected Clips command. Character Animator nabs better puppet rigging, jaw movement and lip sync improvements, a Twitch extension for live streaming performances and character workflow improvements.